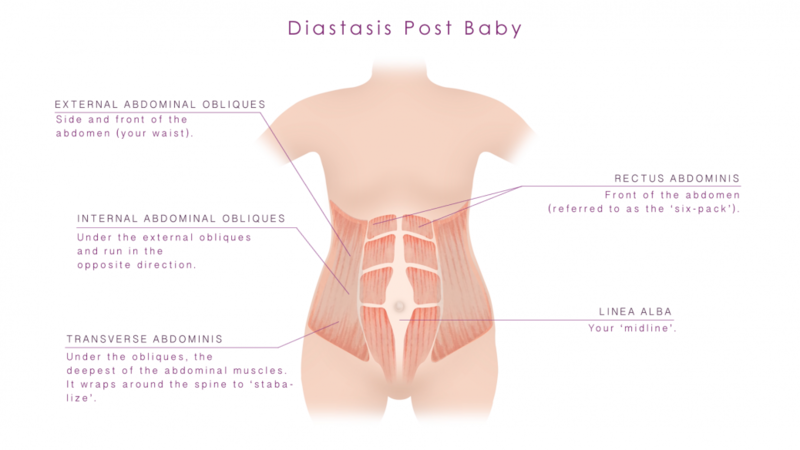 What is Diastasis Recti? Why do you need to know about it and how do you heal it after pregnancy and beyond? It can be one of the most frustrating things after having a baby, the little pooch or ‘Kangeroo Pooch’, aka The Mummy Tummy that just won’t go away! Well, ‘The Mummy Tummy’ or ‘Kangeroo Pooch’ actually has a more medical name which is Diastasis Recti otherwise known as an 'abdominal separation' of more than 2.7cm distance between the two sides of the rectus abdominis muscle which is often called the 'six pack'. It’s important that every woman whose had a baby is aware of it and understands what it is and how to heal it if you have one. You are not usually checked for it during your postnatal check in the UK, USA and some other countries and the advice on how to heal or treat one is sometimes confusing or poor quality. After many years of extensive research, working with Women's Health Physiotherapists and seeing many women come to my studio with diastasis recti, I've developed a range of exercises combined with healthy eating tips to help reduce a diastasis recti. Diastasis recti occurs when there is extra pressure inside the stomach, the area between the chest and the pelvis. During pregnancy pressure is caused because the baby needs space to grow and pushes on the stomach wall. The extra weight and load causes a separation that occurs down the midline of the left and right sides of the rectus abdominis muscle. The rectus abdominis is a paired muscle running vertically on each side of the abdominal wall, otherwise known as the ‘six-pack’. The midline is called the Linea Alba, meaning ‘white line’, and it runs down the front of your stomach from your chest bone to the pubic bone. It is made up of collagen connective tissue. As the baby grows and pushes the abdominal wall further from the inside the connective tissue at the midline stretches. When it stretches sideways it causes the 2 halves of the rectus abdominis muscle to distance, separate, away from each other. This process is a very natural and common during pregnancy, the baby needs space to grow! However, when the deep stomach muscles, connective tissue and other muscles of your core are not designed for the extra load, the pressure leads to an overstretched connective tissue and wider separation, known as Diastasis Recti. There are also other factors which combined with the pressure from the baby lead to Diastasis Recti too, these are incorrect breathing patterns, poor posture, stomach tension and muscular imbalances. You may or may not know about Diastasis Recti or know if you have one. There is limited information given to you at your pregnancy or postnatal medical checks and sometimes the information given out is confusing. However, there is no need to worry about Diastasis and it doesn’t require surgery, doing loads of crunches or sit-ups or starving yourself! However left untreated it can lead to aches and pains and a belly that looks bulged or pooched. Does every woman have a Diastasis Recti after Pregnancy? Often the muscles will come back together after the baby is born, however with some women the separation may stay for some time after having their baby. The width of the separation and the stretch of the connective tissue varies for each woman. It depends on a few factors, such as the size of the baby, whether you had a Diastasis Recti before and it didn’t heal, your age, whether you had your pregnancies close together, extra weight, hormones or high amniotic fluid during pregnancy. Hormonal changes during pregnancy also makes the connective tissue more lax. One piece of research* discovered that 100% of women who were 35 weeks pregnant had some degree of a separation and of these over 60% still had some separation 6 months after having their baby. Another piece of research** showed that 53% of women had a Diastasis Recti immediately after giving birth. 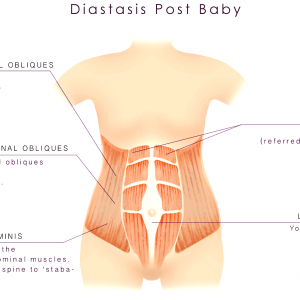 Why do you need to know about Diastasis Recti? Diastasis Recti can be the cause of a ‘pooched’ or ‘bulged’ looking tummy, often referred to as ‘The Mummy Tummy’. It may also be the cause of lower back pain, incontinence and a weak pelvic floor. When the abdominal wall and connective tissue are weak they do not have the strength to provide adequate support for the organs within the stomach. The organs then rest lower within the pelvis so the stomach looks ‘bulged’. With the organs resting lower this causes downward pressure onto the pelvic floor, to weaken the pelvic floor leading to incontinence and in more severe cases pelvic organ prolapse. Weakness in the deep abdominal muscles also means they are less able to provide support to the muscles of the spine or pelvis. This causes a roundness of the spine that puts it under strain, causing lower back pain and sometimes sciatica. Some with Diastasis Recti experience gastrointestinal symptoms too like constipation and bloating after eating. Many people are told it’s something that is part of having children and they have to live with or there isn’t anything they can do. Wrong! Diastasis Recti doesn't require Surgery! but you must avoid rushing straight back into doing conventional general abdominal exercises such as sit-ups, crunches and crossovers or try dieting to flatten your stomach! Exercises such as crunches, sit-ups, planks, some pilates exercises and yoga stretches can make a diastasis worse. All exercises to correct and heal diastasis recti should be in the form of pulling in the abdominal muscles rather than a pushing of them outwards. So, if despite doing stomach exercises you are finding the tummy ‘pooch’ is not going away; it may be due to your choice of exercises. If you’re not familiar with a sit-up, it’s an exercise where you lie flat on the floor and bend your upper body forwards to a sitting position using your stomach muscles. A plank is where you are resting on your forearms or hands and toes with your body in a straight line. Most people do not have the strength to perform a plank with good technique so they do other things, usually without knowing it like clenching the bottom muscles, lifting the ribs, using the shoulders or the stomach bulges so you are not strengthening your core. Any movement that causes the stomach to bulge forward adds further strain to the stretched connective tissue to increase the separation even more. With some of these exercises incorrect breathing patterns, lack of stability and strength to execute good technique all contribute to straining the muscles and tissue to rather than strengthening. These kinds of exercises and even some pilates or yoga moves and poor technique can make a diastasis worse. They can even create one having the reverse effect of what you want to achieve, a flatter tummy. If you are unable to engage your deep core muscles properly and you have a diastasis recti, the bending forward movement of a sit-up or crunch pushes the stomach muscles forward to further strain the already weakened connective tissue of the midline. Dieting to lose lots of weight quickly to try to lose the pooched tummy will not help if you have a Diastasis. Avoid all activities that place stress on the midline, that stretch or overly expand the abdominal wall through everyday activities, exercise, or breathing techniques. Lying backward over a large exercise ball. Yoga exercises that stretch the abs, such as "cow pose," "up-dog," all backbends. Pilates mat and reformer exercises where the head is in a "head float" position, upper body flexion, or double leg extension. Intense coughing without abdominal support. This is a tricky one as you can’t help coughing! To help place your hands vertically across your tummy and with your hands draw your abdomen together during coughing. This provides needed additional support and helps to prevent separation of your midline. Avoid sitting up from a lying position or ‘jack kniving up’, which strains the connective tissue. Instead when you are rising from the floor or getting out of bed you want to do the ‘log roll’. The Log roll is where with your head, shoulders and torso aligned, roll over onto one side, and push yourself up to a sitting position with hands. How do you heal a Diastasis? Healing Diastasis is about strengthening the connective tissue by protecting it from stretching further and strengthening the deepest muscle of the stomach, the Transversus Abdominis. To do that it’s not just about the right exercises for your tummy or some Pilates exercises. It’s a combination of correcting and improving posture and body’s alignment, releasing tension and tightness in certain muscles, the correct breathing, the right exercises, engaging your deep stomach muscle when you are doing caring for your baby and children, daily movement and the right foods. Nutrition focuses on nourishing your body with vitamins and nutrients to strengthen collagen and connective tissue and improving muscle tone. Exercises should aim to engage and activate your deepest muscle of the abdomen, the Transversus Abdominis, your pelvic floor and your core with the right breathing and good technique. Posture and the correct ‘diaphragmatic breathing’ is everything too. If this sounds over-whelming then by making small changes starting with correcting your breathing patterns and posture will make a big impact to healing, strengthening and getting a flat stomach. When you are holding or carrying your baby or child, hold them in your arms in front and close to you so their weight is equally distributed to your body. Avoid holding your child on one hip as it creates muscular imbalances to put your body out of alignment leading to other aches and pains. Wearing a front baby carrier where your baby is in front (especially if you have a big baby) as all the weight will also stretch the connective tissue, especially if you have a tendency to lean back and curve the lower spine. Instead push your baby in a buggy or stroller. Finally, what's important to know is that the stretching of the connective tissue which causes a degree of distance between the rectus abdominis muscle known as Diastasis Recti is in my opinion a natural process. The baby needs space to grow inside you! If you suspect you have some degree of Diastasis Recti, visit a Women's Health Physiotherapist or Physical Therapist who will assess and check your muscles and more importantly the elasticity of your connective tissue. Correct your breathing so you are using your diaphragm muscle and core muscles. Correct your posture which is important to do after pregnancy to realign your muscles. Be active daily with walking of 30 minutes. Release tension in commonly tight muscles such as the hip flexors, hamstrings and muscles of the spine. Do specific exercises such as core contractions, seated squeezes, head lifts, upright push-ups against a wall, the tummy vacuum and squats against the wall. Eat foods which contain essential fats and vitamin C such as berries, wild salmon, avocado and green, leafy vegetables to strengthen the connective tissue which covers the two halves of your rectus abdominis muscle (or six pack!). Take a look at some of my postnatal exercise videos for diastasis recti here. Vicky Warr is a pregnancy and postnatal fitness expert and creator of Bump and Beyond by Vicky Warr, the online postnatal health and fitness studio. Vicky has helped thousands of women improve their health, fitness and body shape in motherhood with her proven pregnancy and postnatal exercise and nutrition online videos. She is expert contributor to Gurgle Magazine and BBC Radio. She has appeared in the Daily Mail, OK! Magazine, Runner's World, Mothercare Magazine and Mother and Baby.